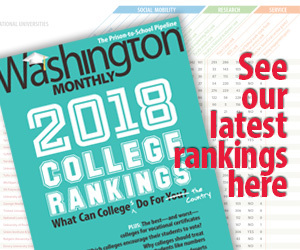 Washington Monthly | What Happened to California’s Higher Education System? What Happened to California’s Higher Education System? Part of the reason for this is that other countries are doing a better job getting young people through college than they used to. Another reason for this, however, appears to be that in the United States we’re actually moving in the wrong direction. California’s public universities were once the envy of the world. Under the state’s pioneering “master plan” for higher education, signed into law in 1960, the top 12.5% of graduating high-school students in the state are guaranteed entry to the well-respected University of California (UC) system; the California State University (CSU) system is open to the top third. Community colleges accept all-comers, including adults. The plan hugely expanded higher education in California, and led also to the emergence of world-class establishments like Berkeley and UCLA. Yet it tied the universities’ fortunes to those of the state. In good times that was fine. But more recently public universities in California have been hit hard by the state’s fiscal woes. Declining state support has forced the UC system to slash costs and to raise average tuition fees by 50% in just three years. CSU fees have risen by 47% in the same period. “The historical model has broken down,” says Mark Yudof, the UC president. California used to enjoy generously funded, high quality colleges and universities that were very cheap for California residents. Now its universities are strapped for cash and hiking tuition every year. As a result, Californians in their 50s are now better educated than those in their 20s. The Economist article points out that private colleges in the state are doing just fine, in many cases expanding due to generous finances and families willing to pay high prices. But, as Yudof points out, that’s not a solution. The decline in the education rate of Californians is a public policy problem. It’s only better policy that’s going to reverse the trend.